Won again today against Errani 6-2, 6-3. Going to be playing under the lights tomorrow night against Henin. Just relaxing in the hotel tonight and getting some good rest. Now vs Henin. Very tough draw for Vera. Henin is the "true #1 seed" in Miami. Henin leads Head To Head 5-0! And Vera never won a set! 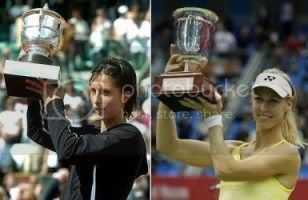 Almost impossible for Vera to beat Henin. Would not be surprised at all if Henin wins Miami. But make the upset, Vera! Hope there is a live stream! Would love to see this match! She looked like she wanted it so badly. Better in the second, that first set got away too fast. Despite all of Henin's errors, Justine was constantly getting Vera on the defense, then finishing the points quickly. I don't know what happened in the first 3 games, but you can't let Henin get up 3-0. By the time I found a live stream, it was 1-4, so I saw what Epigone was talking about. Vera did make a good showing in the 2nd set, no shame in losing to Henin. But if she'd been on tonite, she could have won. First set a statistical mess. Improvement in her serving game in the 2nd, except for UEs. Obviously the UEs tell a lot of the story. But I couldn't figure out why Vera pretty much kept returning to her instead of making JH run around. Also Vera stayed back a lot when I thought she could have run up and taken a lot of the shots early. (easy for me to say ). In addition to being a night match, they began nearly two hours late, didn't they? Except for some minor outbursts, Vera held it together pretty well emotionally. I thought she was going to lose it at one point in the 2nd set, but she recovered nicely. Rest up for Charleston, Vera. A chance to regain some points for a while. Any word on if she'll play Fed Cup? BTW, what's with that Miami crowd? Vera deserved a lot more than that smattering of applause for her effort in that match. Last edited by slk45; Mar 30th, 2010 at 05:04 AM.